Democrat Julia Brownley currently represents Congressional District 26. Brownley is expected to win re-election in 2016 due to a greater Democratic turnout in a Presidential election. 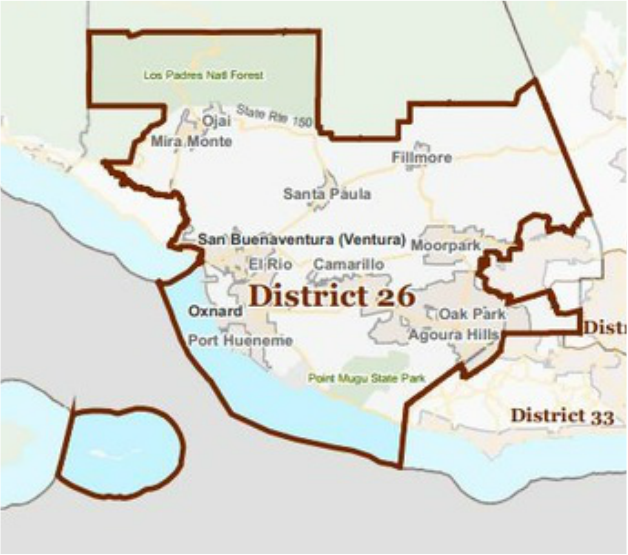 Julia Brownley was first elected to Congress in 2012 to serve as the Representative for California’s 26th District, which encompasses most of Ventura County and a portion of Los Angeles County, including the cities of Ventura, Oxnard, Ojai, Camarillo, Newbury Park, Moorpark, Thousand Oaks, and Westlake Village. As her first committee assignment, Brownley requested to serve on the House Committee on Veterans’ Affairs, where she works closely with Ventura County’s veterans community and Naval Base Ventura County, making sure we provide the services and care our servicemembers, veterans, and their families have earned and deserve. Brownley was elected as Ranking Member of the House Veterans’ Affairs Subcommittee on Health, and she also serves on the House Veterans’ Affairs Subcommittee on Disability Assistance and Memorial Affairs. As Ranking Member of the Health Subcommittee, Brownley focuses on improving veterans’ access to mental and physical health care, improving services for female veterans, and helping servicemembers transition from the military to the VA health care system. During her first term, her Motion to Instruct Conferees on the Veterans Access, Choice, and Accountability Act of 2014 was widely credited for getting the stalled conference committee back on track. Locally, Brownley spearheaded the expansion of the VA’s Oxnard Community-Based Outpatient Clinic, increased staffing at the clinic, and held a field hearing at CSU Channel Islands to bring attention to the need to expand VA services in Ventura County, including complementary and alternative medicine. Brownley also sits on the House Committee on Transportation and Infrastructure, where she serves on the Subcommittee on Aviation, the Subcommittee on Coast Guard and Maritime Transportation, and the Subcommittee on Highways and Transit. Since coming to Congress, Brownley has been a steadfast champion of the Port of Hueneme; secured the funds necessary to dredge the Channel Islands Harbor and Ventura Harbor, and to replenish the sand at Hueneme Beach; passed two amendments to the Water Resources and Development Act to improve harbor maintenance activities, kept the towers open at the Camarillo and Oxnard airports; and spearheaded legislation to transfer land from the former Oxnard Air Force Base back to Ventura County to encourage business development around Camarillo Airport. Brownley began her career in public service as a School Board member in 1994 where she served three terms. She was elected to the California State Legislature in 2006, where she served as Chairwoman of the Assembly Education Committee for four years. In addition to chairing the California Assembly Education Committee, she served on every educational committee in the Assembly including the Committee on Higher Education, Budget Subcommittee No. 2 on Education Finance, and the State Allocation Board. Then-Assemblywoman Brownley was awarded numerous honors for her leadership in education and the environment. She was one of just 10 legislators in 2011 with lifetime perfect scores by the California League of Conservation Voters. Brownley received “Legislator of the Year” awards, the highest honor a legislator can receive, from the California Association for Bilingual Education, the California Council for Adult Education and California Adult Education Administrators Association, the Congress of California Seniors, the California School Boards Association, the National Board for Professional Teaching Standards, the California Federation of Teachers, and by the California League of High Schools. Brownley also received the “2010 Environmental Champions Award” from the Environmental Working Group, and was honored as one of "12 Remarkable Women" by the National Women's Political Caucus, Los Angeles Westside in 2008 and as the “Woman of the Year” by the YWCA in 2005. After graduating with a B.A. in political science from George Washington University and earning an M.B.A. from American University, Congresswoman Brownley worked in marketing in private industry before finding her true calling in public service. She resides in Westlake Village in Thousand Oaks, and has two children, Fred, currently attending UCLA Medical School, and Hannah, who recently completed her Master’s Degree in Belgium.